I will start off by saying that I don't claim to be an expert in SEO. 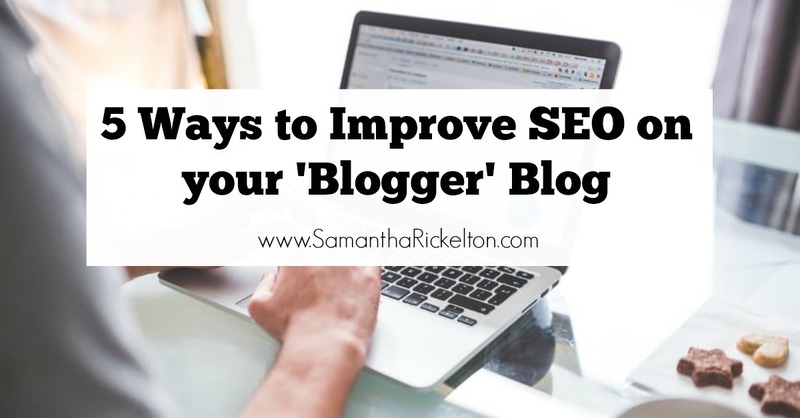 What I will say though is that I've spent the last 2 years reading a lot about how to improve SEO on your 'blogger' blog and have put some of these techniques into practice. A lot of my blog posts now rank on page one of google for specific search terms (some are even the no1 result) and around 70% of my blog traffic for North East Family Fun comes from google. 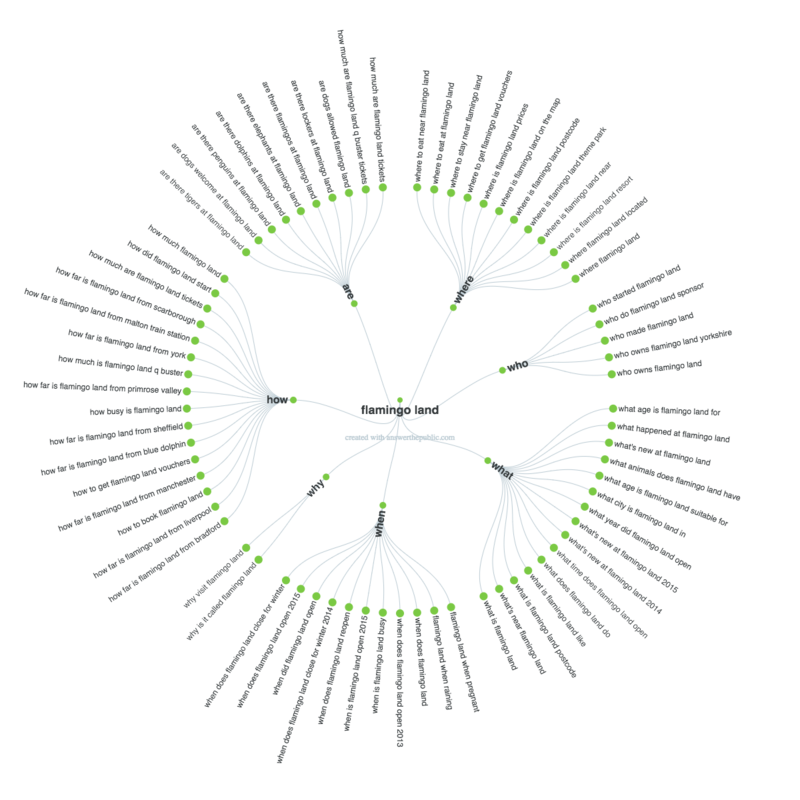 There is a lot to learn about SEO and I am continuously updating my knowledge. I thought I would be handy to share some of the basics today, as for my first few years blogging, I didn't know any of this and really wish I had looked into it earlier. It is usually better if your keywords are 'longtail keywords' which are a group of words together. There is A LOT of competition on google so trying to compete for single words is almost impossible I would say. You need to tink about what would people google around your proposed topic. One way to do this, is to use google autocomplete to give you a few ideas. For example, if I was planning a post about a trip to Flamingo land, I would type 'Flamingo land' into google. Then I added 'Yorkshire' which brought up 'Reviews'. You can use this technique for pretty much anything and it pays to play around with the word combinations a little until you find a set of keywords you are happy with that will fit the nature of your article/post. If you have even less time to plan your keywords, you can try the really handy website called AnswerThePublic.com. I typed Flamingo land into this website and it brought up 71 of the most popular questions that the public have asked google about Flamingo land - You can write a blog post to answer one of these questions. Something like 'What age is Flamingo land for?' might work well as your keywords for example. I will say that I don't plan keywords for every article I write, but most of the time, I do. Now that you have your Keywords sorted, you can now get to grips with improving your post's SEO. Your blog post permalink is automatically set to the first few words of your blog post - you need to change it to include your keywords. To do this, click 'Permalink' on the side bar of your blogger post editor, then select 'Custom Permalink' and add your keywords into this. The first part of your Permalink always stays the same (your main URL and then date) but you can change the second part. I separate each word with a dash. 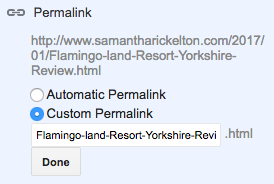 So the end part of our URL would either read 'Flamingo-land-Resort-Yorkshire-Review' or 'What-Age-Is-Flamingo-Land-For'. You then need to click 'done'. As long as your post will be published in the same month, you can now use the post URL to pre-schedule Social Media if that's your thing - even before the post is published (I do this if I'm on holiday and know I have a post that needs to be published). 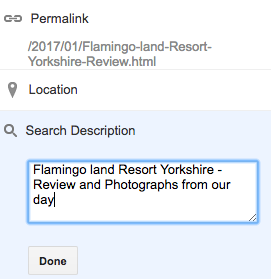 So the full URL of this post will be http://www.SamanthaRickelton.com/2017/01/Flamingo-land-Resort-Yorkshire-Review.html. You can also find the search description for your blog post on your post editor side bar. You need to have this switched on in settings (this post tells you how to do this). The search description is the little blurb you see under your post when you post it on Social Media and it also tells google what your post is about. If you leave this blank, the first few sentences of your blog post will be used instead. Don't fall into the trap of adding keywords with commas - eg flamingo land, resort, review, Yorkshire as this looks spammy and doesn't read well. A simple sentence or two will suffice. I usually use my blog post title with a few extras so it could be 'Flamingo land Resort Yorkshire - Review and Photographs from our day'. The key is to include your keywords in your search description but in a sentence form. To add the Alt Text and Title Text simply click on your image once it's been added to your blog post. Click 'properties' and then complete the two boxes. It's also worth noting that this is the text that will automatically show up if someone pins that image from your blog post. If you can and it's natural, use your keywords throughout the blog post (but not in an excessive way so it reads spammy) and in headers - I have used 'improve SEO on your 'Blogger' blog' as a header and a few times throughout the text of this post for example. I hope you've found these tips handy - as mentioned, I'm not an expert and these are just methods that have worked for me. Follow my page SamanthaRickelton.com on Facebook here if you'd like to keep up to date with future posts like this. Bookmarking this, thank you for sharing.